(Beyond Pesticides, October 19, 2018) Pollinator advocates and the Center for Biological Diversity (CBD) are imploring the U.S. Environmental Protection Agency (EPA) to deny Bayer CropScience’s application for use of “Sivanto,”a pesticide product with the active ingredient flupyradifurone, a chemical the company claims is safer for bees, but poses the same risks at the notorious bee-toxic neonicotinoid insecticides. If approved, Sivanto would be sprayed in tobacco-growing states along 300,000 acres in the southeast U.S., areas home to more than three dozen species protected under the Endangered Species Act (ESA). Bayer’s proposal for expanded uses comes after EPA’s own assessment indicated risks to endangered species, and despite the fact that the agency has not undergone an ESA mandated consultation with federal wildlife agencies. For the countless flying insects, birds, and bats already under significant threat from neonicotinoids, adding another systemic insecticide to the mix will only make the situation worse. Bayer AG is characterizing flupyradifurone as being harmless to honeybees. However, flupyradifurone, being a systemic pesticide, can negatively impact many non-target species. 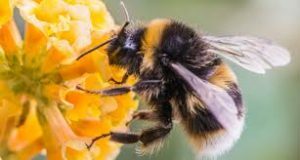 In fact, flupyradifurone impacts honey bee brains in a similar way to neonicotinoids, as it impairs learning, memory and the honey bees’ affinity for nectar rewards. Advocates worry that growing use of flupyradifurone would tragically add to the existing negative effects still being caused by widespread use of other neonicotinoids on corn and soy in states where tobacco is also grown. Therefore, CBD has insisted that the EPA also seek consultation on any synergistic and cumulative effects of flupyradifurone with other pesticides in use nearby. CBD is currently suing over EPA’s failure to engage in ESA consultation before it first registered this controversial pesticide. Flupyradifurone, being highly water soluble, is not just harmful to honey bees, but also poses significant threat to aquatic ecosystems sheltering invertebrates such as aquatic mayfly larvae and rare freshwater mussels. In fact, among the 38 threatened and endangered species inhabiting areas where tobacco is grown, 17 are species of freshwater mussels that play essential water-purifying roles in aquatic ecosystems. The Center and allies sued the EPA over its initial approval of flupyradifurone, challenging the agency’s refusal to take common sense measures to protect endangered species from this new and controversial pesticide. This litigation is in its initial stages at the Washington, D.C. Court of Appeals. Take Action! Protect Pollinators and fragile aquatic ecosystems! Least-toxic products exist. Learn how to aerate, feed soil organisms, and watch the desired plants’ health improve. Instead of enabling the chemical industry’s whack-a-mole, or a mere product-for-product swap, read Eating with a Conscience to learn how buying local, organic, regenerativally-grown food is the better choice for your family and the planet as a whole. Organize a local coalition and collaborate with others to keep pressure on grocery store owners, nurseries, hardware stores, and elected city officials to eliminate neonicotinoids and related compounds, while offering certified organic and organic compatible products in their supply chain. Eliminating the sale of neonicotinoids, related compounds, and other harmful pesticides does not mean that retailers will have nothing left to sell their customers. Beyond Pesticides released The Well-Stocked Hardware Store, an online toolkit that identifies organic compatible products for hardware stores seeking to find replacement products that can be used with an organic system approach to land management. See Beyond Pesticides database of Products Compatible with Organic Land Management. Beyond Pesticides highlights the actions of Eldredge Lumber, a hardware store in Maine, through the video Making the Switch. “You’re protecting the environment, your family, your children and grandchildren, and your neighbors. Nobody wants to have pesticides drifting into their front or rear yard, and people are just loving it, they’re feeding into it. I couldn’t be happier,” says owner Scott Eldredge in the video. Buy certified organic food, which, by law cannot be grown with neonicotinoids or related compounds like flupyradifurone. This entry was posted on Friday, October 19th, 2018 at 12:00 am	and is filed under Agriculture, Bayer, flupyradifurone, Pollinators, Uncategorized. You can follow any responses to this entry through the RSS 2.0 feed. You can skip to the end and leave a response. Pinging is currently not allowed.